Availability 1 pcs. at central warehouse. Kan afhentes i butik (Struer, København) eller sendes til dig indenfor 1-2 hverdage. 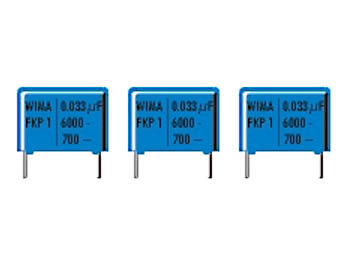 These WIMA Polypropylene (PP) capacitors have reliable internal end terminations. They use a simple concept: The wire makes electrical contact with the complete surface of the electrode, which ensures minimal inductance. This results in capacitors with a good attenuation og self-resonance (se produktdataark). With Metal Foil Electrodes, Schoopage Contacts, Double-Sided Metallization and Self-Healing Internal Series Connection for Highest Current Carrying Capability. Most suitable for pulse and high frequency applications in audio circuits, switch mode power supplies, converters in drives and power electronics, deflection systems in monitors and TV-sets, and electronic ballasts. Widely used for EMI suppression, VCO timing and sample-and-hold applications.